When we first started this post, it was a Pricechopper and we were certain this house, featured in November 2008 as a "That's Rather Hideous" contender, had come back to haunt us with a price reduction. Then we noticed it's not the same house. Good god, there's another one of these nightmares on the market. Two fortified stucco boxes with baffling and disturbing decorative pilasters on the exterior. 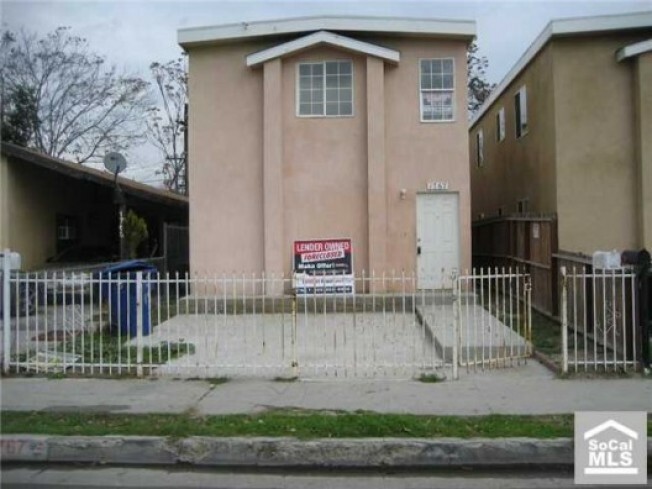 Like the other one, this is also located in Watts, and consists of two units. More via the listing: "Newer built two story single family resident with 3 bedrooms and 2 bathrooms upstairs and 3 bedrooms and 2 bathrooms downstairs." The kitchen has granite counter tops, but needs to be completed. The house is "sold as is in it's present condition with no warranties expressed or impied. No FHA Financing, this property will not qualify." While the first one seems to currently be off the market, its asking price was $269,000. Asking price for this house: $209,900 or $73 per square foot.